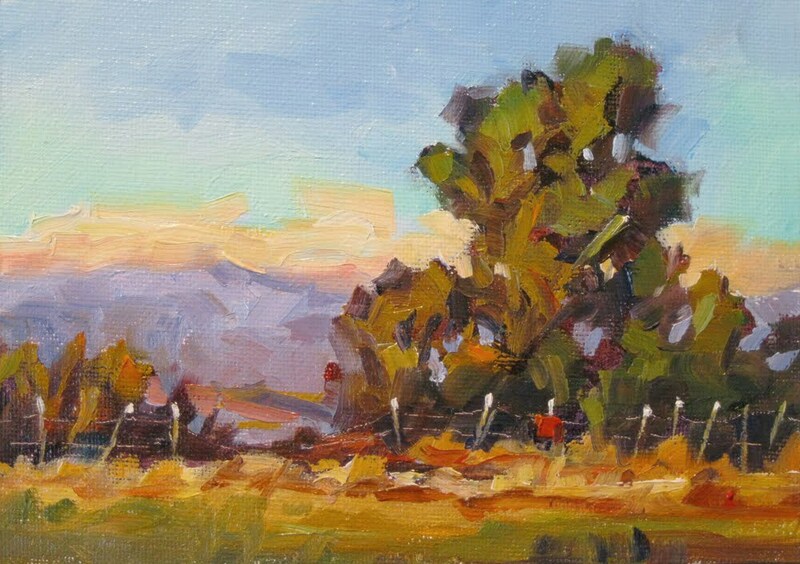 There are many ways to approach Plein Air painting. 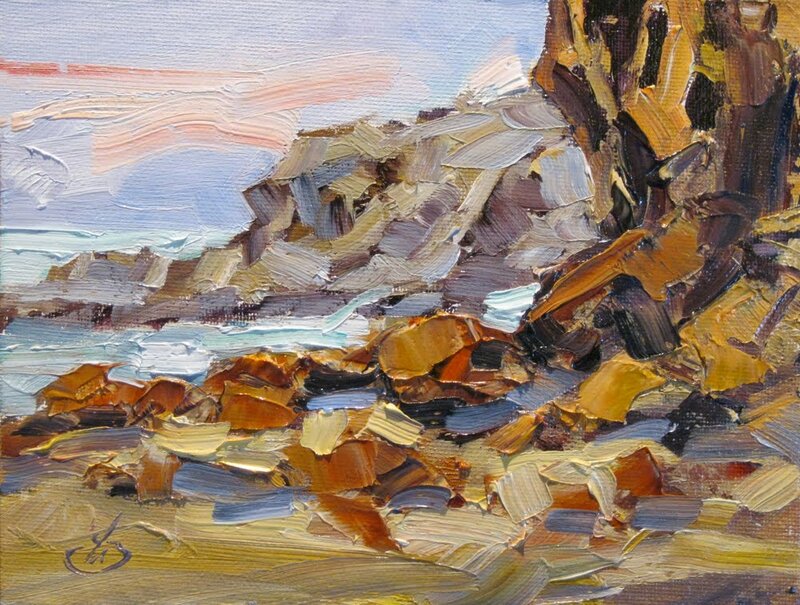 We explored just one of them in the class where this 12x16 inch canvas was painted. 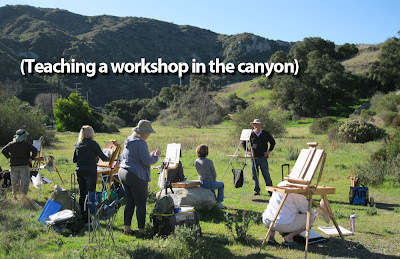 In a new 5-session workshop beginning in Orange County this Saturday I will teach more about this method and other approaches to creating successful Plein Air paintings. For example I’ll show how to paint in an even bolder and “more painterly” way. 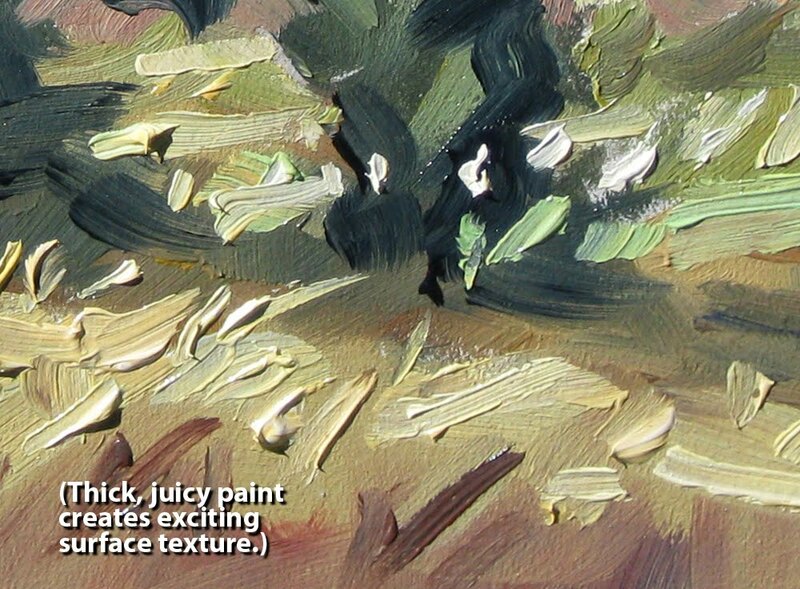 And the opposite: how to paint in a much tighter and more “realistic” way. 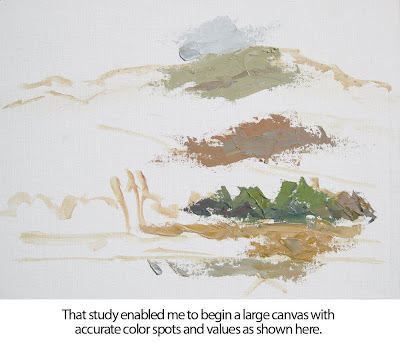 I’ll show interesting surfaces to use that give different results than canvas. 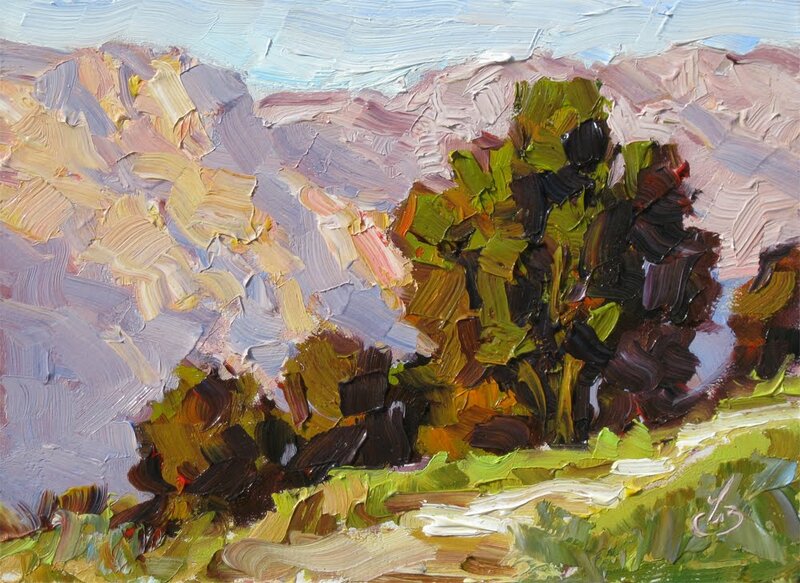 I’ll demonstrate economical equipment options, ways to choose the best view to paint, and much more. 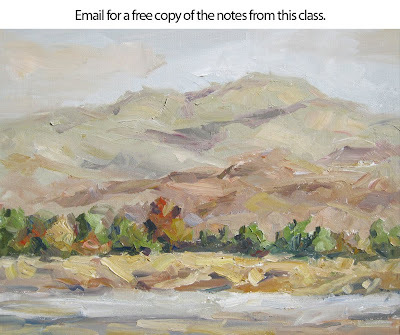 Email me for more information about my new 5-session Plein Air workshop, or to get a free copy of the notes that recap highlights from the class where this painting was done. Irena and Pat have attended many of my Plein Air Workshops. Here they are framed against a dramatic tree during one of those workshops, and I wanted to feature this feeling in my painting. 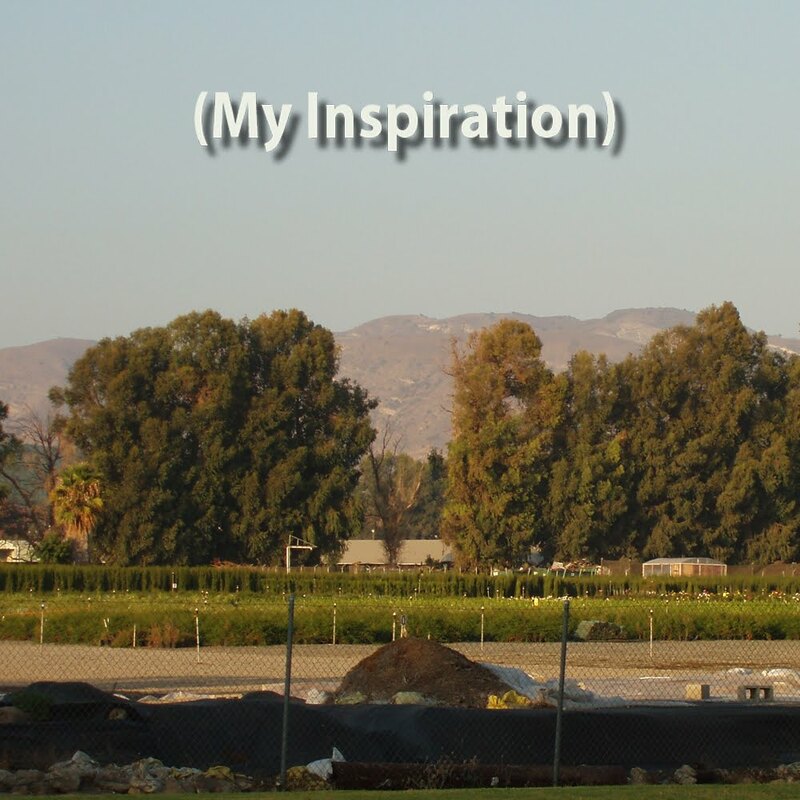 As always, I take inspiration from Nature, and blend it with my reactions to the scene. I exercised artistic license regarding elements that didn’t contribute to the painting, and I feel the result is a stronger composition. I hope you agree. Paint the “Wow!” and skip the rest. That’s what I tell artists in the workshops I teach. This painting is an example of that. I ignored fussy details in favor of showing my feelings about this inspiring view from the rim of a canyon. That was enough; any more would have been overworking it. ENJOY THE VIEW! Wild tropical parrots woke me this morning. 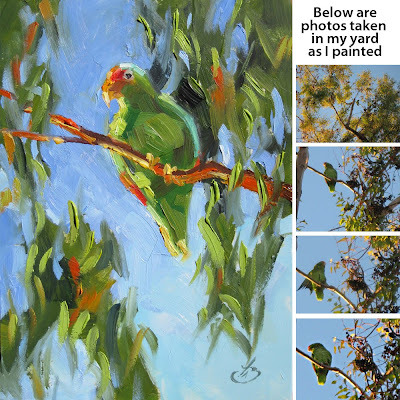 They gathered in the eucalyptus and palm trees in my yard. And they’re LOUD. Quick as a flash I grabbed my pochade box and raced out into the yard. Wet paint was on my palette from yesterday so I was ready to go. I dove right in, standing with bare feet in cold wet grass as they nested high above me. Most parrots kept moving from branch to branch, but this fellow remained in the same spot long enough for me to paint him. I even had time to snap a few photos. 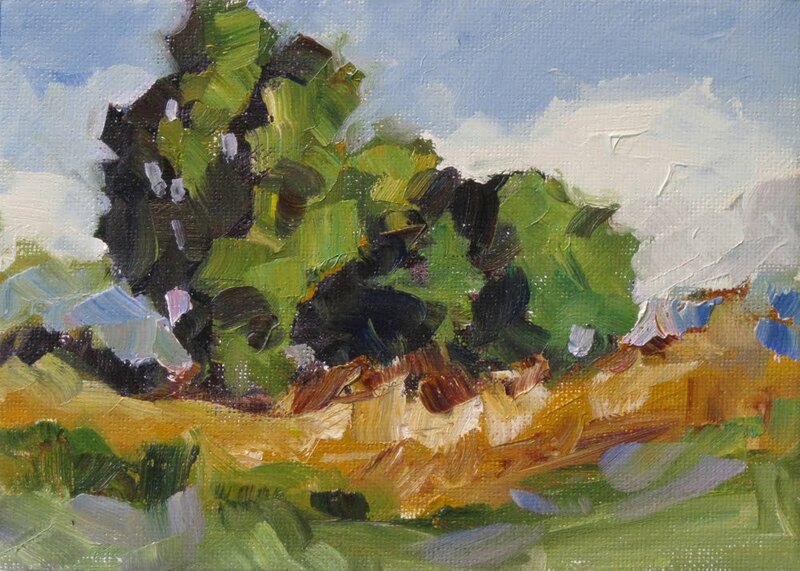 “TIME TO WAKE UP!” is an original plein air oil painting on a 5x7 inch foam board panel. I felt like trying something unusual. 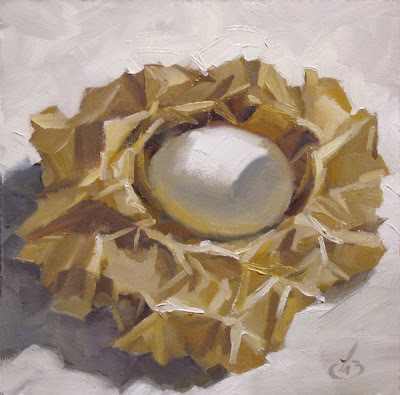 I crunched a piece of kraft paper into a nest shape, placed an egg within the nest and this is the result. “A STEP BACK IN TIME” is an original oil painting on a 5x7 inch Masonite panel. I painted this while standing in weeds beside this rural roadway. I used the compact pochade paintbox that you’ve seen in many of my YouTube videos. I love that little pochade box. 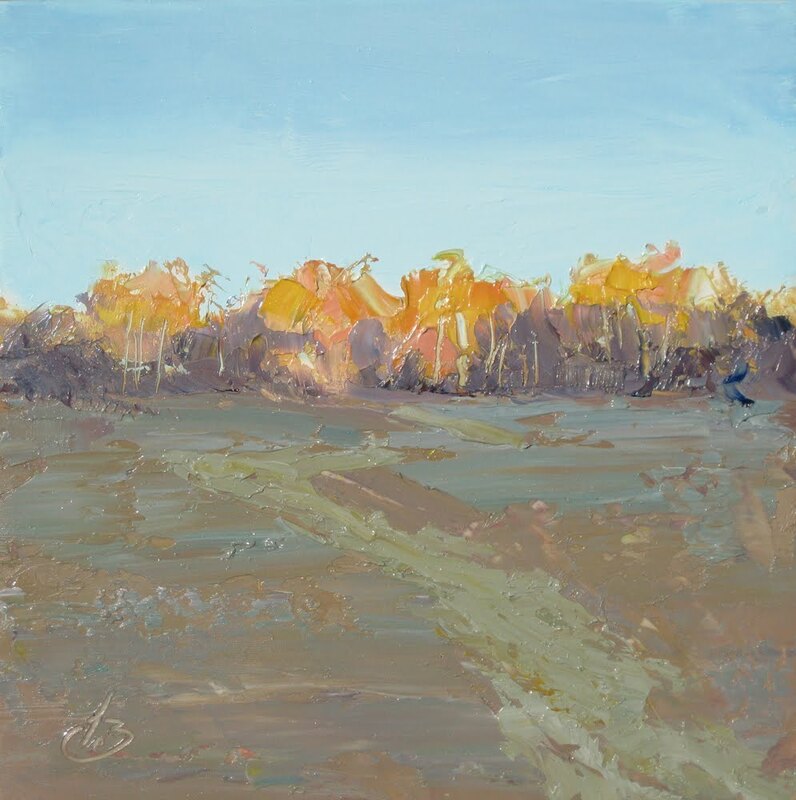 I keep it in the trunk of my car whenever I’m out riding in the country and in a case like this it lets me set up and paint within moments. When I finished, I simply left the painting clamped in place and closed the box. I was packed and ready to travel. The late afternoon light brought out the rich colors of the scene, and it was my goal to capture that effect. This one has some delicious colors, interesting “edge treatments” and a wonderful feeling of having stepped back in time to a slower paced era. I hope you like it. 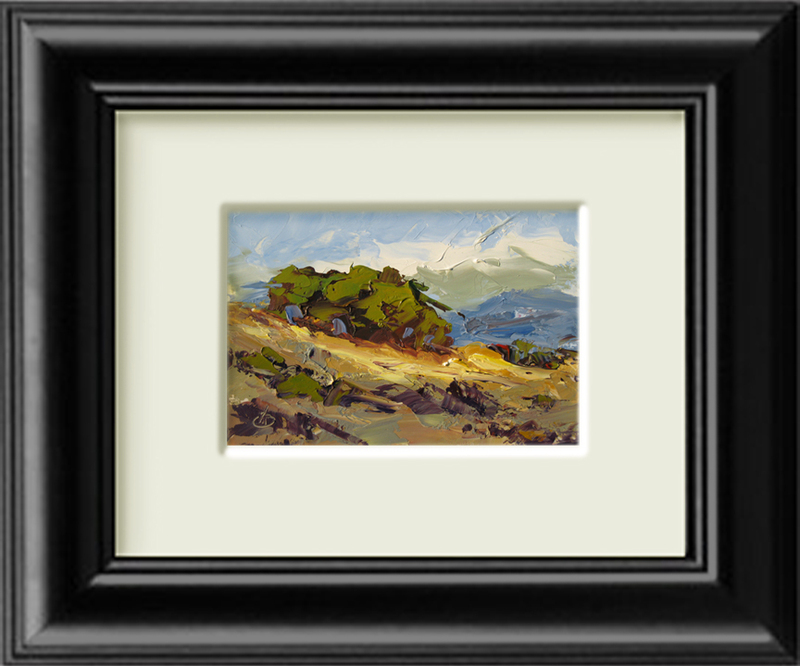 This painting is done in oils on a 14x18 inch unstretched canvas and it is currently on eBay. 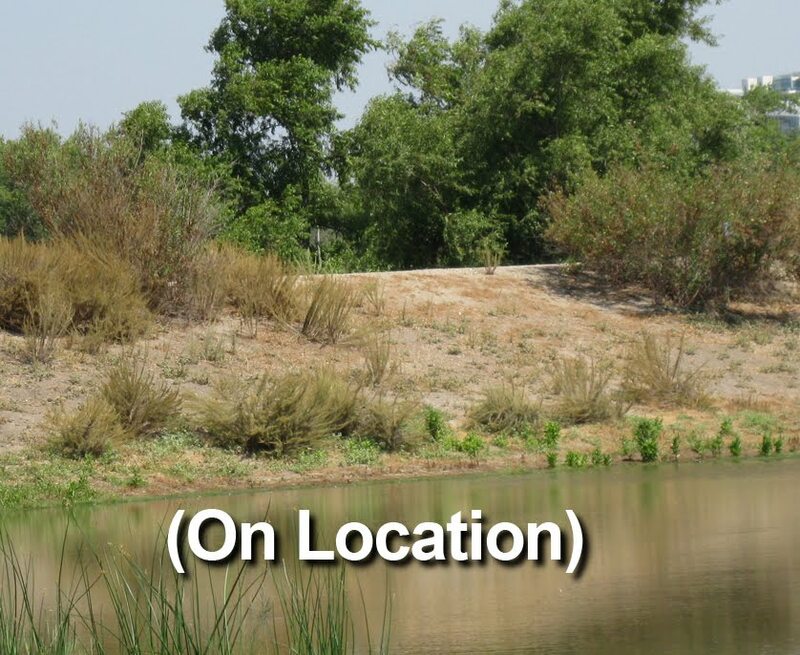 It’s a great way to begin any landscape no matter how detailed you plan to make it. That’s what this painting is all about. It’s a quick study of a landscape showing a hill, trees, distant mountains and stormy skies. And that gets you off to a solid start because it perfectly captures the essence of the scene. All work done after this point is merely filling in detail. Be bold. Take a chance and go for it. 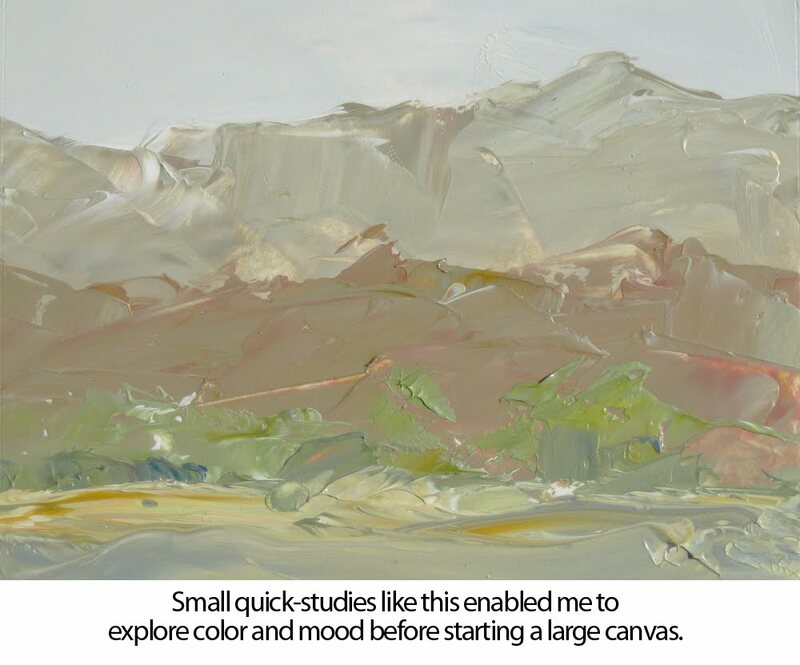 Using bold descriptive brush strokes and carefully planned color mixtures, I captured the elements of the scene that had caught my eye and inspired me to paint it. 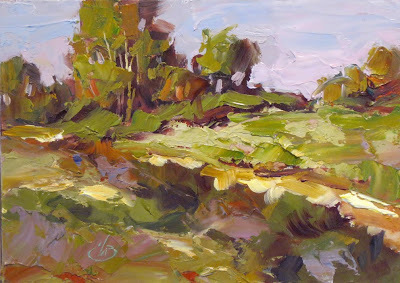 This was a demonstration painting during another outdoor workshop I taught for other artists. 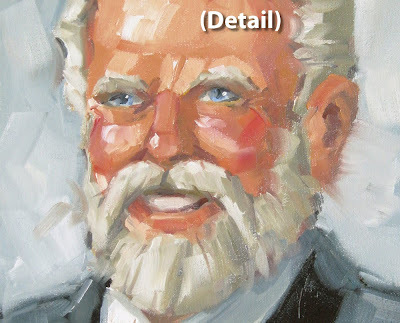 I had planned to paint a great deal more detail, but when I saw the results here I decided I liked it that way and decided not to take it any further. Check out the detail image to see the brush work I used to capture these effects. I was very pleased with the result. I hope you like it too. It’s a great way to begin any landscape no matter how detailed you plan to make it. That’s what this painting is all about. It’s a quick study of a landscape showing a hill, trees, distant mountains and wind-swept skies. Be bold. Take a chance and go for it. 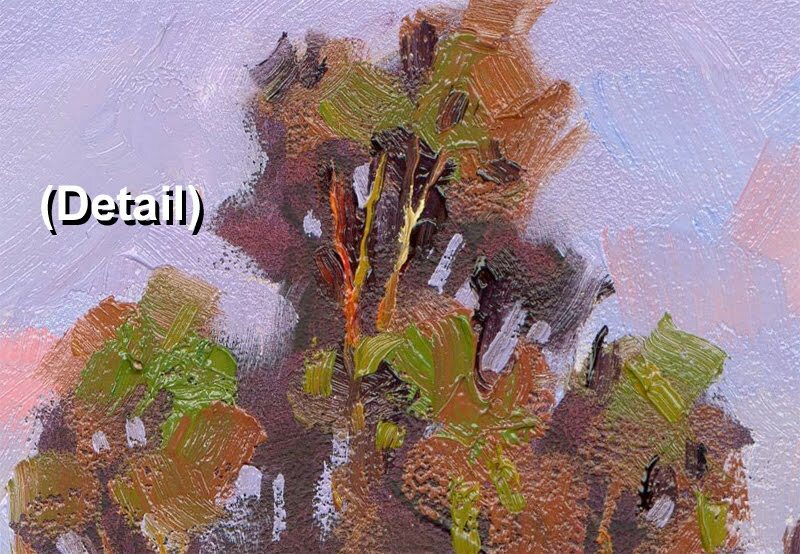 Using bold descriptive brush strokes and carefully planned color mixtures, I captured the elements of the scene that had caught my eye and inspired me to paint it. This was a demonstration painting during an outdoor workshop I taught for other artists. I like grays that have color and life to them! 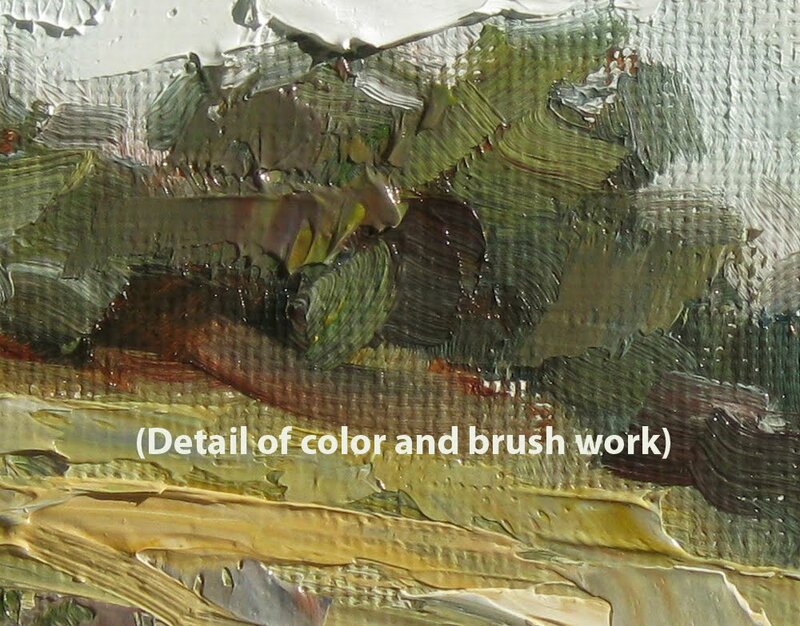 These rich grays can bring a painting alive – even one with muted color. And they help establish a particular mood that’s restful and exciting at the same time. Here’s how I mix these grays. Rather than simply opening a tube of gray I use a wide variety of very subtle hues mixed from the “spectrum” colors on my palette: reds, yellows and blues combined with white. 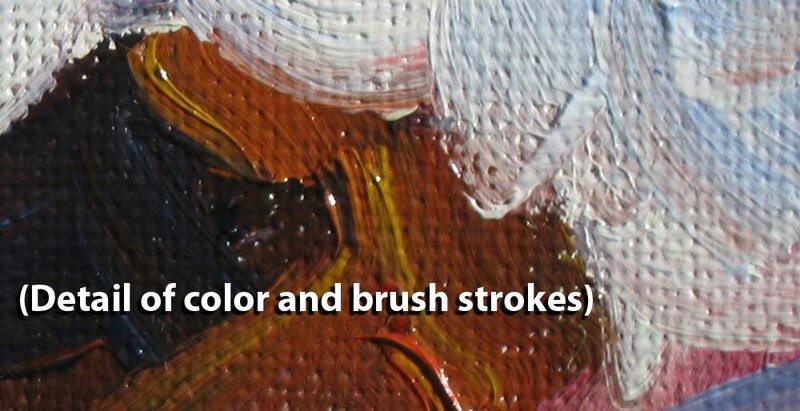 This results in mixtures much more exciting and varied than using a tube of black or gray. 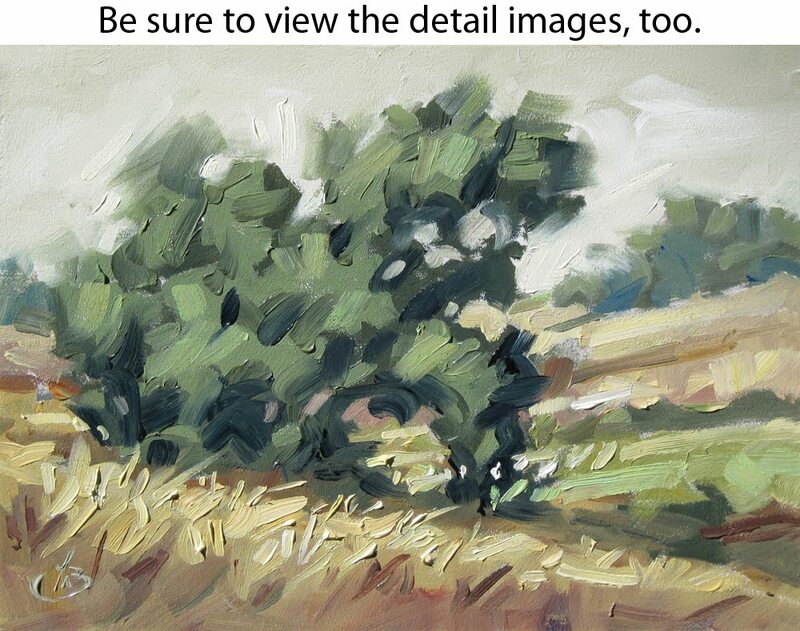 This painting is an example. 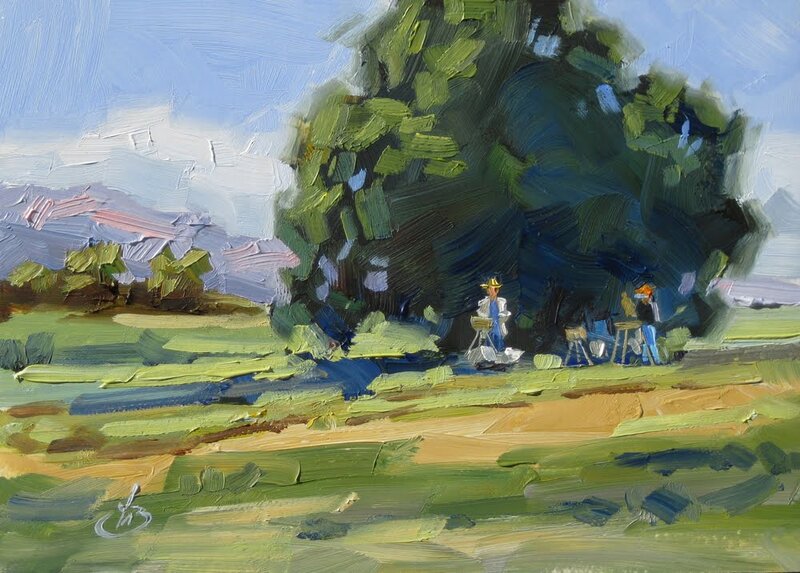 This 6x8 inch oil painting was done on location (en plein air) as a demonstration for other artists attending a workshop I conducted. It was a gray, rainy day and that was the feeling I wanted to capture in this painting. 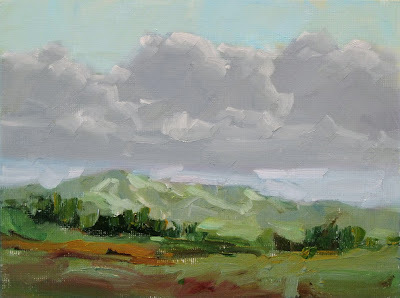 I liked the quiet moodiness of the day, with stormy skies and muted colors throughout the scene. 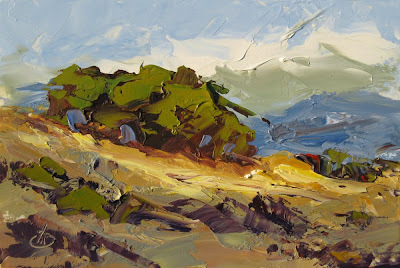 Most collectors familiar with my work know me for my brush paintings, but I also paint frequently with the palette knife, which provides a very different visual experience. 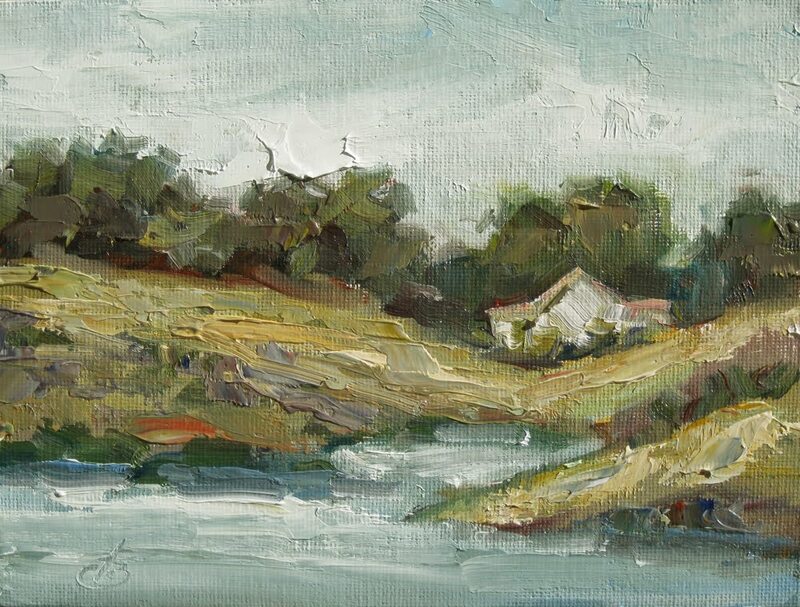 This 6x8 inch coastal painting was done with a combination of brushes and the knife together. 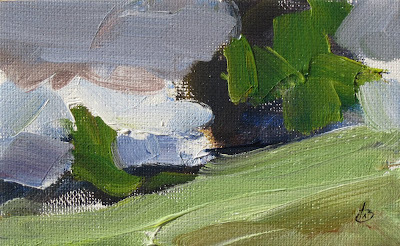 Artists often feel they should limit themselves to just brushes or the knife in order to maintain a consistency of style. 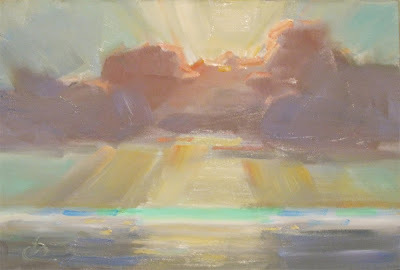 Many of the great masters disagree, and so do I.
Richard Schmid is an excellent example. 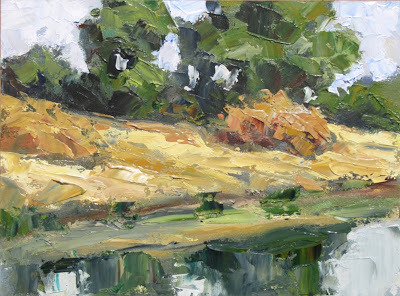 Richard Schmid is one of the most accomplished masters of our time, known best for his masterful use of the brush in both figure painting and landscapes. 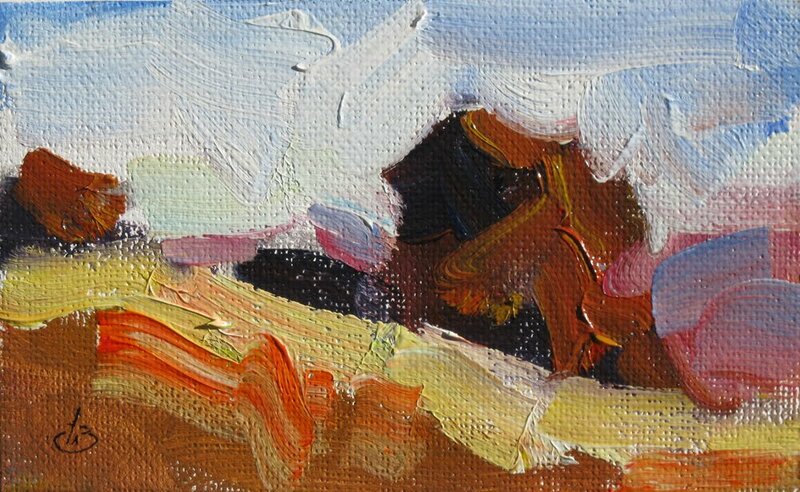 Interestingly he also endorses and uses the palette knife in his work. In his book “Richard Schmid Paints The Figure” (published in 1973) he mentions being inspired by one of his heroes, Nicholai Fechin as a master of the knife as well as brushes in his work. 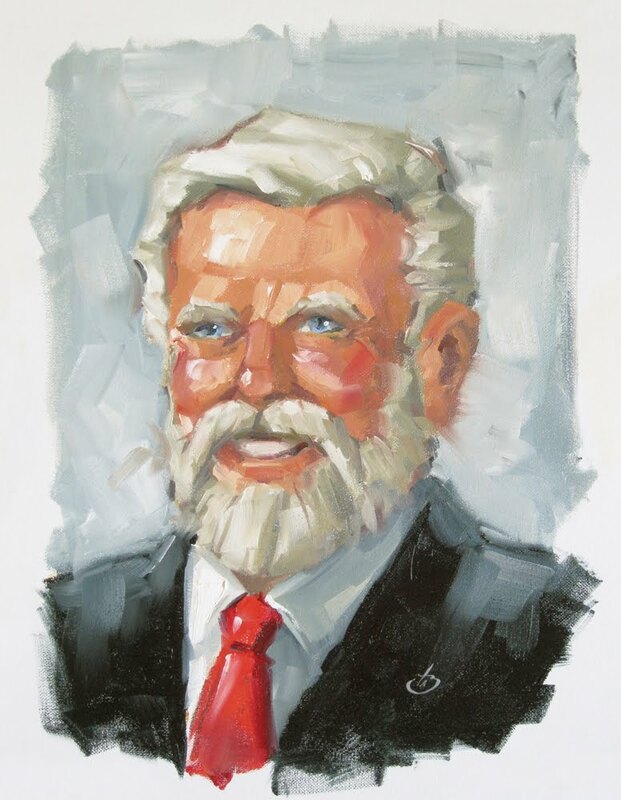 More than two decades later in his classic book “Alla Prima – Everything I Know About Painting, by Richard Schmid” he again devotes time to knife painting and describes situations when the knife is the best tool. 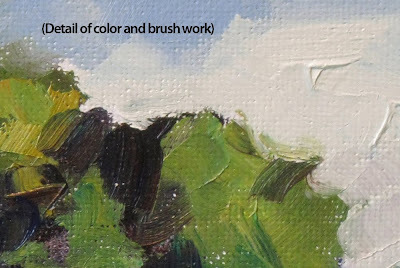 An example shown in this book is “Cascade Barn” which was painted exclusively with the knife. 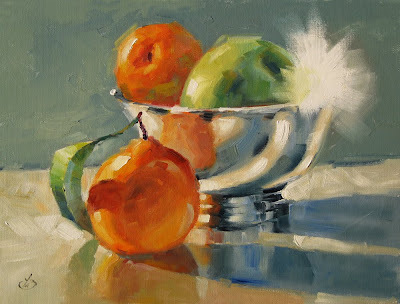 Emille Gruppe, another artist whose work I admire, describes how one of his teachers the great Charles Hawthorne forced students to spend time learning how to use the knife exclusively in order to broaden their skills. I enjoy using both tools. I often use the knife to complete portions of paintings that are primarily done with brushes. And I also create many paintings using only the knife, which creates a very different visual experience than paintings done with brushes. THE PERFECT VALENTINE GIFT, A DELICIOUS NO-CALORIE CHOCOLATE CUPCAKE. Thanks for looking (please don’t lick the screen). 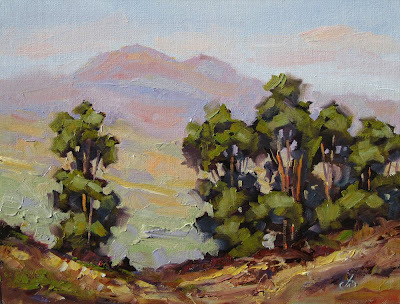 ARTISTS: JOIN MY SPECIAL SATURDAY WORKSHOP – SECRETS TO PAINTING MORE “KEEPERS” ON LOCATION. 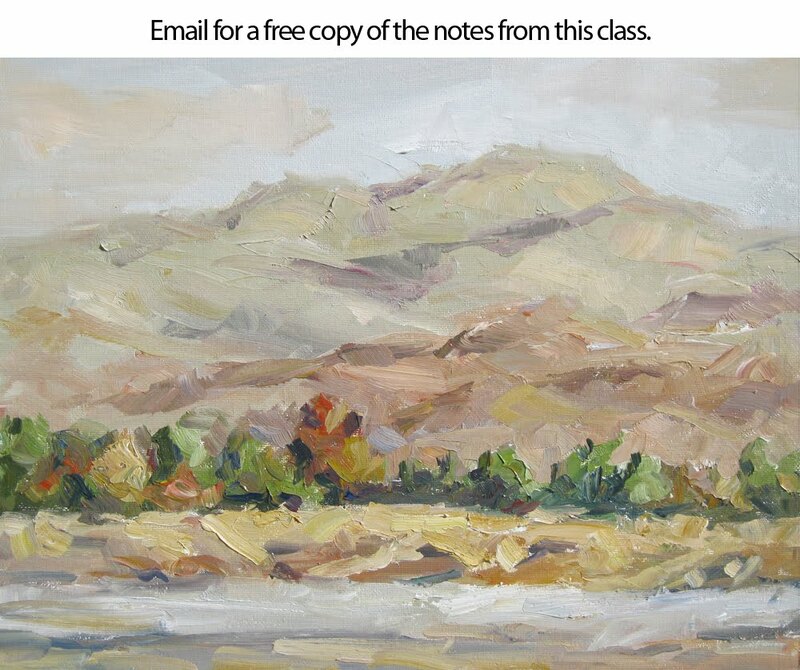 FREE BONUS: Everyone who attends will receive a free online tutorial of this lesson following the workshop. See me at class for details. I’ll show you tips, tricks and techniques that work every time. For example I’ll show you how to identify and nail down the “magic” you see in nature. 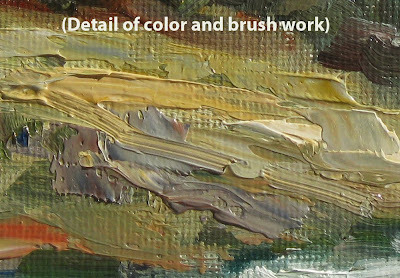 And how to spot the values and hues that will give your painting a solid foundation. I’ll get you started on the right path right away, for an easy start and successful finish. 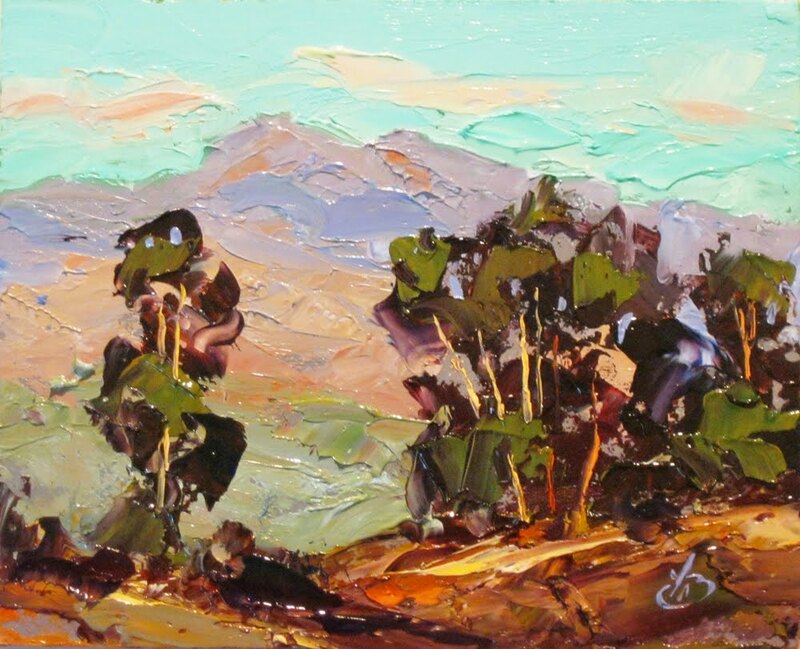 On this blog recently I’ve been discussing some of the artists whose work I enjoy. Matt Smith and Camille Przewodek are among them. 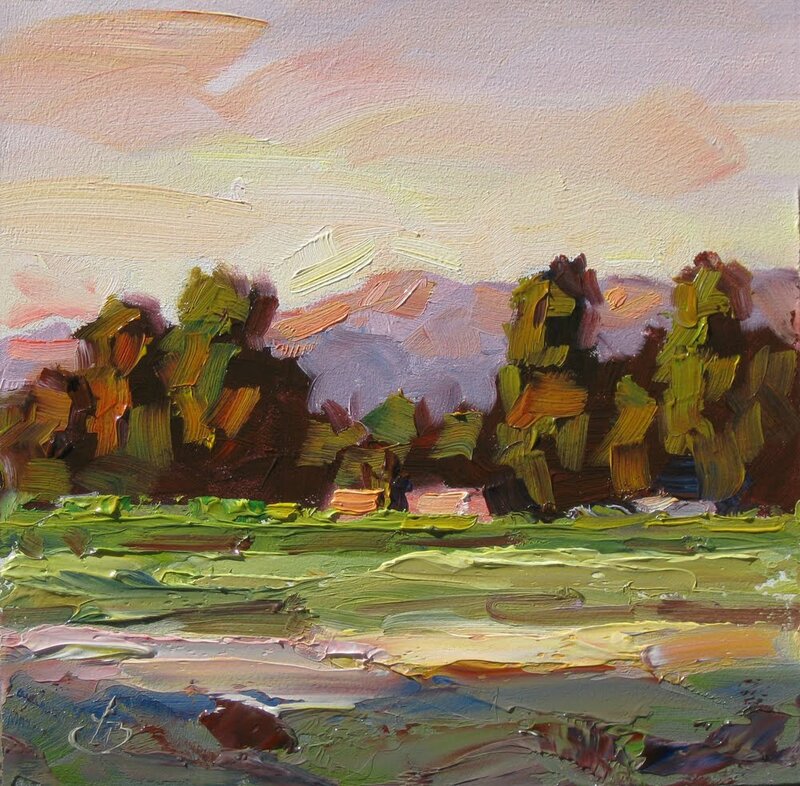 Matt Smith tends to use subdued hues while Camille Przewodek emphasizes bold, lively colors in her work. I use whatever is most appropriate to express the mood I wish to convey at the moment. 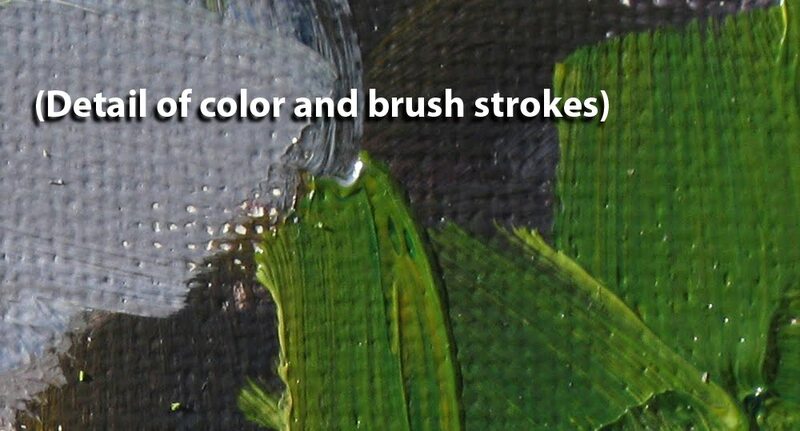 This includes the entire range of color, from the very saturated hues of yesterday’s painting to the more muted, restful colors of this painting. 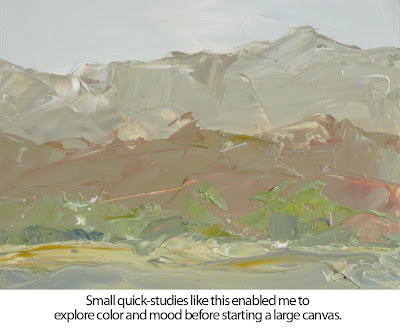 On this particular day the lighting and colors were softer and grayer, so my painting leans toward colors that capture that feeling. 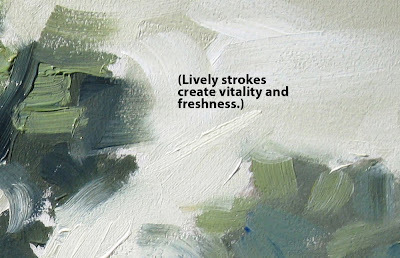 And yet I wanted to maintain a lively feeling at the same time, so I used a palette knife rather than brushes for this one. This was painted during a Plein Air workshop I taught for other artists. 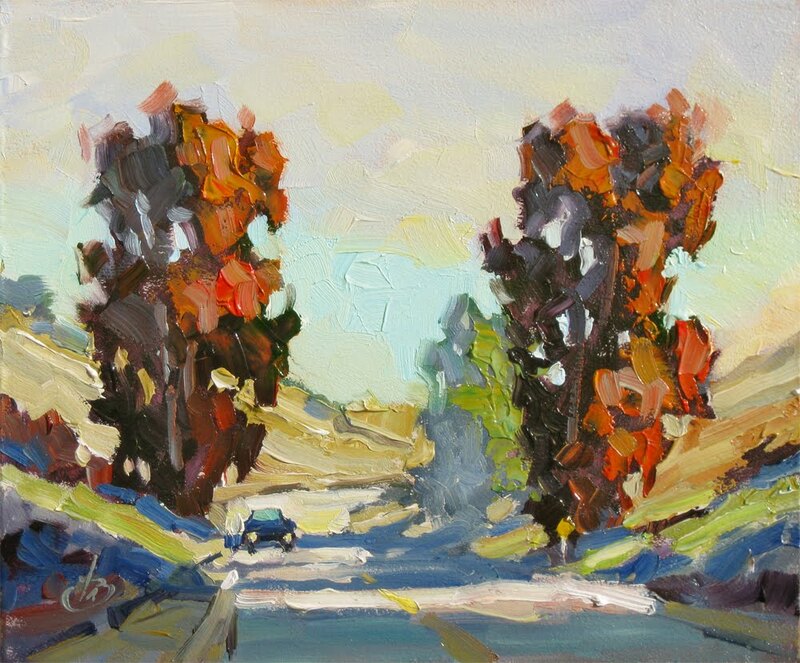 For comparison with my painting I’m including a photo of the actual location taken as I painted this. ARTISTS: JOIN MY SPECIAL SATURDAY WORKSHOP – SECRETS TO PAINTING MORE “KEEPERS” ON LOCATION. DON’T MISS THIS ONE! You’ll learn my techniques and tricks that work every time. For example I’ll show you how to identify and nail down the “magic” you see, and transfer that without fail into a large canvas. 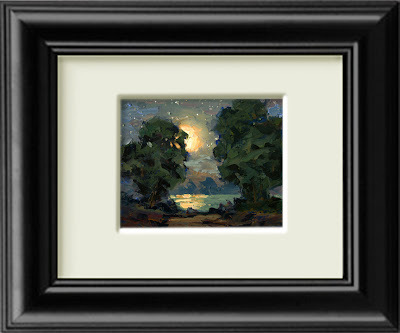 One way to do it is to use a small quick study to capture the moon fast, while it’s fresh. 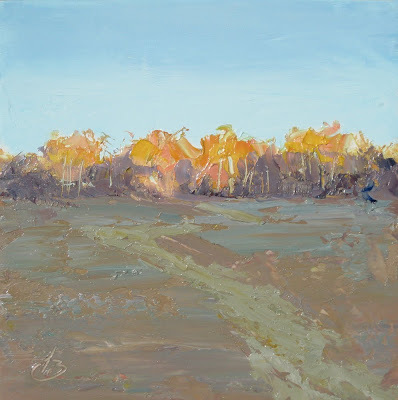 A combination of the brush and palette knife works great for this. 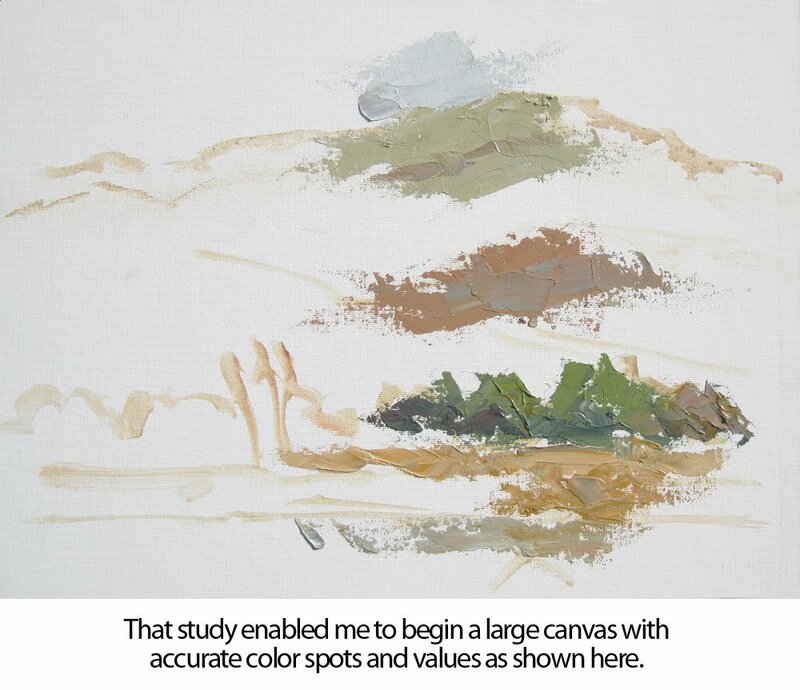 Then you can work at your leisure on a large canvas, using the quick study to keep you on course. I’ll show you how. 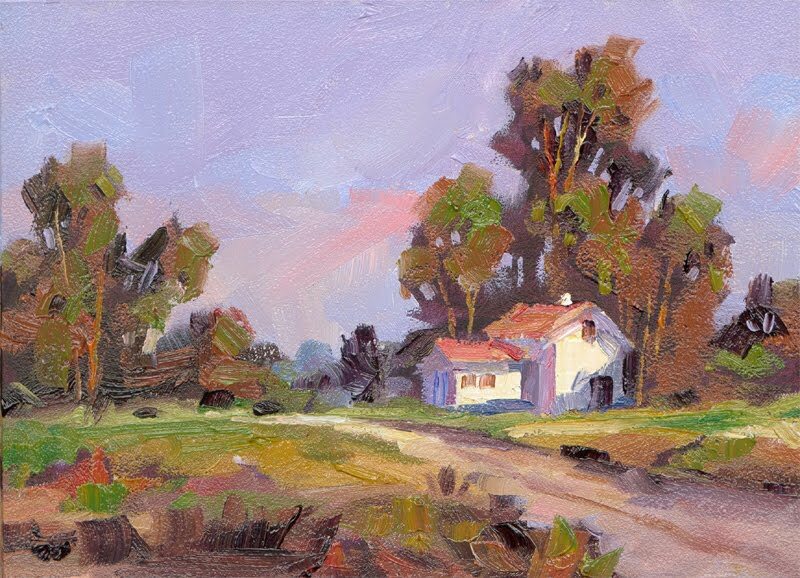 I’ll also show you how to “see” both values and hues simultaneously, to more easily visualize the potential of a scene before starting. It puts you on the right path right away, for a solid start and successful finish. 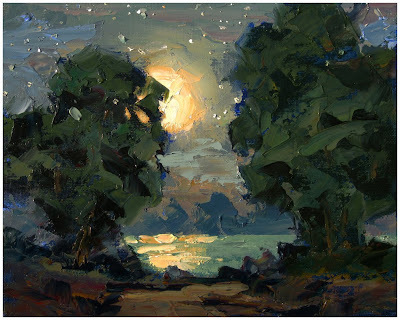 Recently on this blog I’ve been discussing other artists whose work I enjoy, including Matt Smith, Camille Przewodek, Richard Schmid, Nicholai Fechin, Charles Hawthorne, Henry Hensche, Emille Gruppe and others. My comments until now have dealt with their thoughts on brushwork, palette knife techniques and color usage – all of which relate to this painting. If you haven’t read those posts yet you may want to scroll back on my blog to check them out. I hope this brief discussion was of interest. Thanks for stopping by. Matt Smith and Camille Przewodek are two of the artists whose work fascinates me. 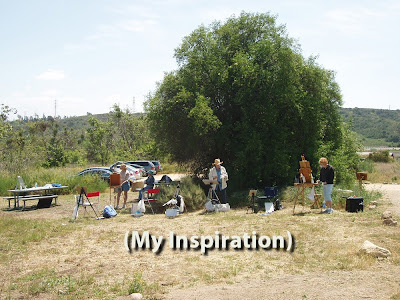 While teaching a workshop recently I was asked about some of the artists who have inspired me. Richard Schmid is one of those artists, and in yesterday’s blog posting I mentioned his comments on using the palette knife. Today’s painting was done using both the knife as well as brushes by the way. 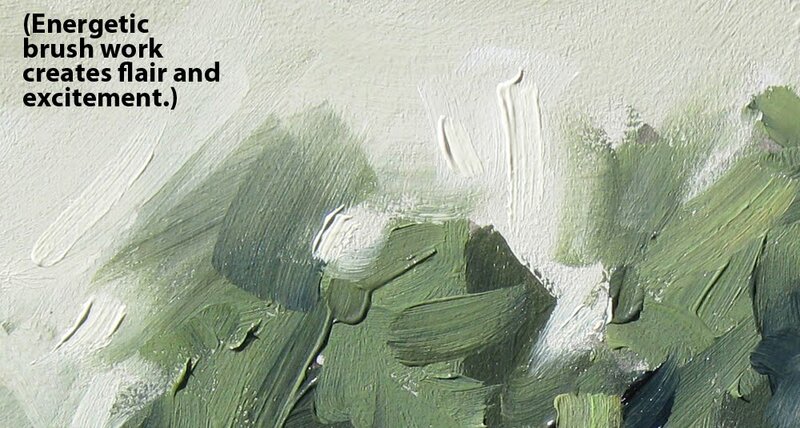 Matt Smith and Camille Przewodek were two other artists I named whose work I greatly admire, each for very different reasons. I have observed each of them during plein air competitions. Each of them creates marvelous paintings even though their styles are very different. 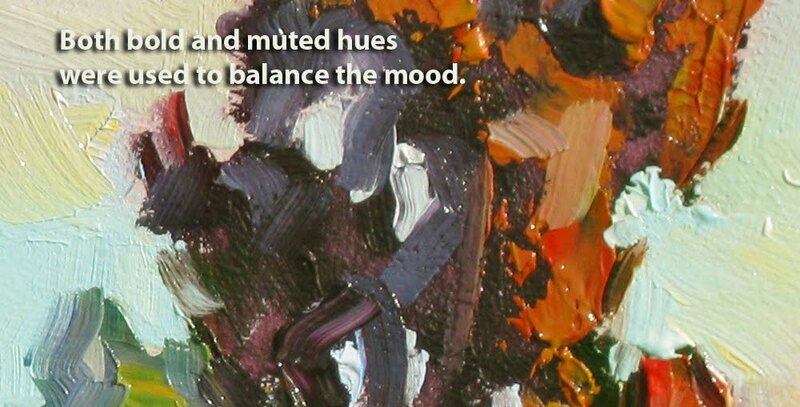 Especially regarding the colors they choose to put into their paintings. 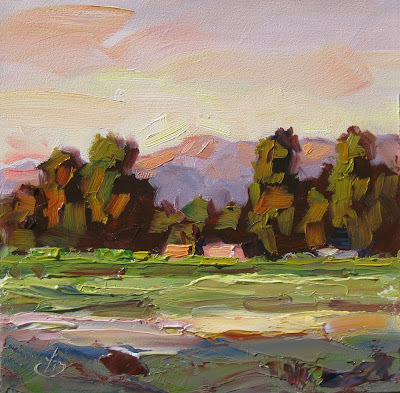 Matt Smith tends to use subdued hues while Camille Przewodek sees herself as more of a colorist, emphasizing bold and lively colors in her work. The painting shown here tends to emphasize rich hues, which was the response I had to the landscape before me as the warm light of late afternoon washed across the landscape. Painting with the palette knife as compared with brushes is an interesting subject. Artists often feel they should limit themselves to just one or the other. 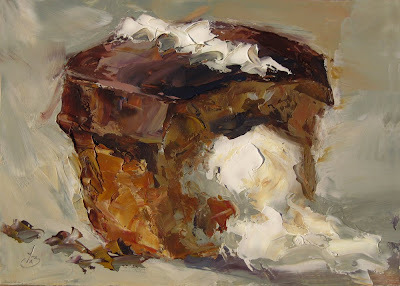 Many of the great masters disagree, as do I.
Richard Schmid is a excellent example. Richard Schmid is one of the most accomplished masters of our time, known best for his masterful use of the brush in both figure painting and landscapes. Interestingly he also endorses and uses the palette knife in his work. Emille Gruppe, another artist whose work I admire, describes how the great Charles Hawthorne forced students to spend time learning how to use the knife exclusively in order to broaden their skills. 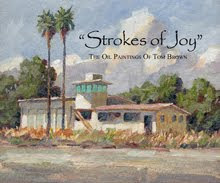 My goal when painting is to record what the heart sees; to capture the visual poetry of the subject. I take inspiration from Nature, and blend it with my feelings. This is an excellent example. I was interested in the mood here and wanted to capture that as simply as possible, ignoring all unnecessary detail that didn’t contribute to that feeling. I was very pleased with the results. I hope you like it too.